For those of you depressed by the gloomy start to 2009, and the feeling that both motorsport and the right to own any vehicle more exciting than a Renault Clio are luxuries we may not enjoy for too much longer, here’s a little light relief. Here’s the ultimate democratisation of the luxury car market for our straitened times – news comes from City Hall in London that the prestige carmaker is one of two winners of a competition to produce a modern re-imagining of the iconic Routemaster bus. Aston was working in partnership with the architects Foster and Partners. The prize was also awarded to Capoco Design Ltd, an automotive design company based in Wiltshire whose submission is reminiscent of the successful Millennium Taxi design. The winning design ideas will now be passed on to bus manufacturers to develop into a final proposal and Transport for London expects to award a contract to develop and build the first new bus for London towards the end of next year. 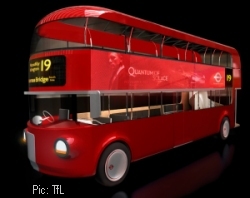 The first of the new buses will be on the streets of London by 2011.
iMo robotic car – the latest must-have Apple product? Categorised under Uncategorized, tagged under Aston Martin, British Steam Car Challenge, Mercedes marques. « British GP: East Midlands Airport the key?